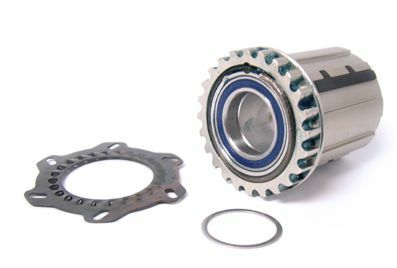 AC say:- "The 17 mm Shimano/SRAM freehub body kit includes: AC Freehub body (8, 9,10 Speed Compatible) with steel face inserts to prevent cassette gouging, two 440C Stainless Steel cartridge bearings in the body, engagement cam plate and 0.5 mm x 17 mm internal engagement spacer". The 17mm axle freehub is designed to work with American Classic 17mm axle road and mountain hubs. This will not work with any Victory, Victory 30 or Terrain wheelsets, please call for assistance. The 15mm axle freehub is designed for current Victory, Victory 30 and Terrain hubs, and older 15mm axle hubs.